In his first feature movie Brick (2005), writer-director Rian Johnson created a self-contained world of noir double-crosses, femme-fatales and hardboiled dialogue, and set it all in the microcosm of a Californian high school. For The Brothers Bloom (2008), his second film, Johnson takes the same interest in the intricacies of language and story-telling, and takes it on a globe-trotting con-man adventure. 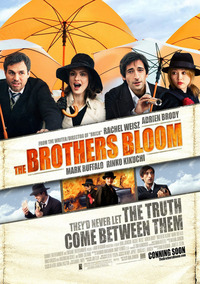 The eponymous brothers, Stephen (Mark Ruffalo) and his younger sibling, who simply goes by “Bloom” (Adrien Brody) are first introduced in an opening that may rank with some of the greatest pre-title sequences of all time; the orphaned brothers, shunted from foster family to foster family (due to an increasingly hilarious list of offences) discover that Stephen has a talent for planning and orchestrating profitable fictions. Narrated in rhyme by Ricky Jay, the film is rarely better than this superb beginning, which expertly sets the whimsical, fantastical tone of The Brothers Bloom. 25 years later, Stephen and Bloom – along with their sidekick, the almost-silent Bang Band (Rinko Kikuchi, who almost steals the film with her genius for physical comedy) – are the greatest confidence men on the planet. But Bloom is unhappy; having lived his entire life playing a part in Stephen’s cons, he has decided to quit once and for all, and pursue an “unwritten life”. Stephen, however, pursuades Bloom into one last job. Penelope Stamp (Rachel Weisz), is a billionaire eccentric shut-in who has dreamed of living precisely the kind of adventure that Stephen prides himself in creating for their marks. Of course, as the movie progresses, Bloom and Penelope begin to get a little closer than Stephen would like – or perhaps this is exactly what he would like. This is where Johnson really makes the genre-rework shine. At almost every stage of the film it is unclear just how much of the story is ostensibly ‘real life’ and how much of it has been written by Stephen (who, the audience is informed, meticulously constructs his cons as works of arch-literature, laced with allusion, symbolism and thematic arcs). Whilst The Brothers Bloom does not have the same tautness that was so evident in Brick, it boasts instead the rambling looseness of a great story revelling in the act. Any one of the characters (save perhaps Brody’s, who is maybe the least odd) could seem out of place in another film, but all fit comfortably into the world of Bloom, an archaic universe where people travel by steamship and overnight trains, and communicate via telegram. The production and costume work by Jim Clay and Beatrix Aruna Pasztor is flawless and gives a tangible fairytale feel to the entire movie, sitting well with Nathan Johnson’s score (as with Brick, Rian’s cousin provides the musical accompaniment). Johnson’s script lyricises both the trickery of the con-men’s lives of artifice and the love story between Bloom and Penelope, and all the lead actors delivers fully on their character. There are two further supporting performances worthy of note, including Robbie Coltrane as The Belgian, a bit-part player in the brothers’ con and Maximillian Schell as The Diamond Dog, a sinister figure from the brothers’ past. One of the film’s best scenes occurs when The Diamond Dog and Bloom meet unexpectedly in a hotel bar – the threat in the air is utterly palpable, and the two Oscar-winners are firing on all cylinders. The Brothers Bloom belongs to the storyteller, though; Mark Ruffalo has never been better than he is here as the razor-sharp, gregarious Stephen. And just as Stephen’s marks will never appreciate all of the art and craft that goes into the cons he writes them into, it is likely that many audiences will not get all of the nuance that Rian Johnson has built into Bloom. An endlessly intriguing, and frequently beautiful film that will certainly reward (even require) multiple viewings, and inspire endless debate.